The renovation work is now complete and our Tiree holiday cottage is finally ready to receive guests. Our builder, Bruce Kemp, has done a terrific job in transforming the cottage from its original cold, drafty and damp condition into a warm, modern, comfortable self catering cottage… and only 150 yards to a large white sandy beach – the perfect location for family holidays. One of the greatest aspects of the cottage is of course, the fantastic far-reaching views – with panoramic sea views out of both the front and back of the cottage it has a wonderful feeling of wilderness and yet it’s only a few minutes walk to both the main supermarket in Scarinish as well as the Scarinish Hotel with it’s bar and restaurant overlooking the small beach and stone harbour. 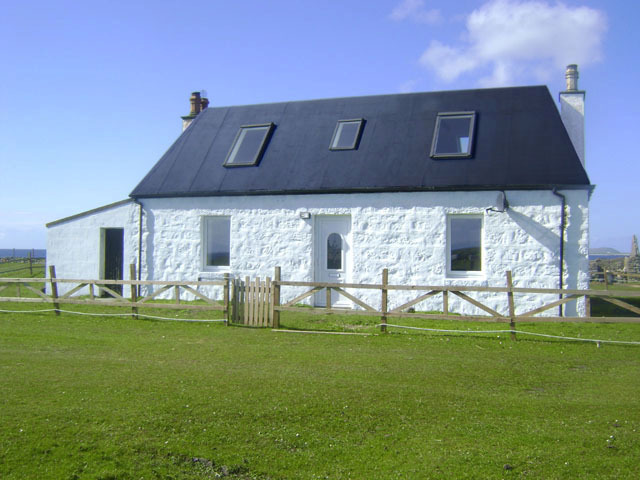 Please explore our website and do not hesitate to drop us an email or give us a call with any enquiries regarding renting our holiday cottage in Scotland – we hope you have a fantastic holiday on Tiree.